Kliofem tablets are a type of hormone replacement therapy (HRT) prescribed to women after menopause to replace the oestrogen no longer produced by the body. This relieves menopause symptoms and restores the oestrogen’s protective effect against cardiovascular disease. Kliofem is a continuous combined HRT used to treat postmenopausal women who have not had their natural period for at least 12 months. It should be taken daily. Kliofem is only intended for women who have not had a hysterectomy. Women who have undergone a hysterectomy, should seek an HRT that does not contain progestogen. 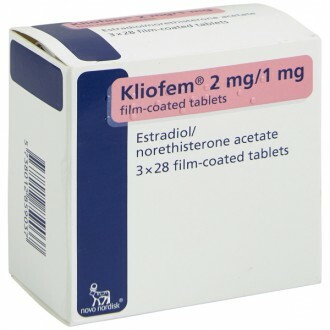 Kliofem is manufactured by Novo Nordisk and contains two female hormones, estradiol (a synthetic form of oestrogen) and norethisterone acetate (a synthetic form of progesterone). These hormones behave similarly to the natural hormones produced by the female body. During menopause, the amount of oestrogen produced by a woman’s body declines. This can result in symptoms such as a hot face, chest or neck. Doctors prescribe Kliofem to alleviate these symptoms if they begin to interfere with daily activities and routine. After menopause, many women are diagnosed with osteoporosis. The condition is marked by weak bones and an increased risk of fractures. Kliofem helps prevent osteoporosis after menopause. The medicine is prescribed to women whose periods have stopped for more than a year and who have not undergone a hysterectomy. If you have fibroids in the uterus, gallstones, migraine, diabetes, epilepsy, asthma, otosclerosis, Systemic Lupus Erythematosus (SLE), triglycerides, increased risk of developing clots, high blood pressure, growth of the womb lining, fluid retention due to kidney or cardiac problems, inform your GP about before starting Kliofem. This medicine is not suitable for pregnant and breastfeeding women. Womens’ ovaries gradually produce less oestrogen before menopause, and oestrogen levels in the blood decline as a result. These declining levels can cause distressing symptoms, such as irregular periods, night sweats, hot flushes, mood swings and vaginal dryness or itching. 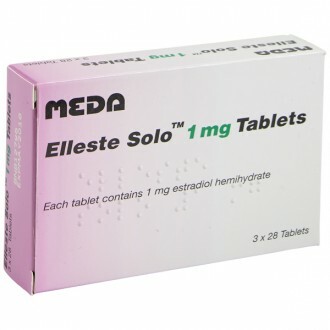 Oestrogen in the form of estradiol can be given as a supplement to replace the falling hormonal levels in the body and help reduce symptoms. This is known as hormone replacement therapy. 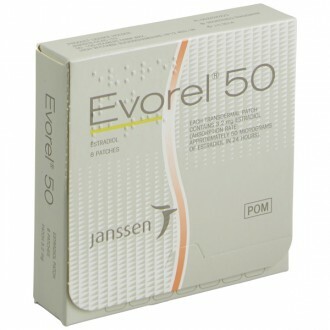 HRT is usually only required for short-term relief from menopausal symptoms. You should review your use at least once a year with your doctor. Women who have not had a hysterectomy need a progestogen as part of their HRT. This is because in women with an intact uterus, oestrogen stimulates the growth of endometrium (uterine lining), which can increase the chance of endometrial cancer occurring if the growth goes unrestricted. Progestogen opposes oestrogen’s effect on endometrium and reduces the risk of cancer though does not eliminate it entirely. This is known as combined HRT. HRT is also used to prevent osteoporosis in postmenopausal women. Declining levels of oestrogen during menopause can affect the bones, causing them to become thinner and more prone to breaks. Oestrogen supplements help prevent bone loss and fractures that may occur in women in the years after menopause. Women at risk for fractures after menopause include those who have had an early menopause, those who have had recent prolonged corticosteroid therapy (e.g. prednisolone), those who have a small, thin frame and smokers. You will find more information about HRT and medications for preventing osteoporosis in the factsheets linked below. Hormone replacement therapy to relieve symptoms of menopause. Read the enclosed leaflet carefully before starting a course of Kliofem tablets. One tablet should be taken each day, at around the same time, either before or after eating. Take the tablets continuously, without a break between packs. 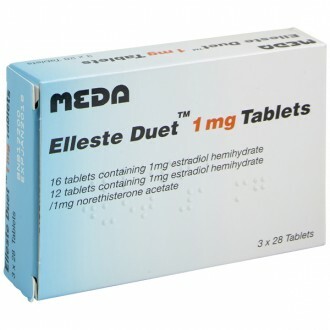 Estradiol 2 mg (as estradiol hemihydrate) and norethisterone acetate 1 mg.
lactose monohydrate, maize starch, talc, hydroxypropylcellulose and magnesium stearate. The film-coating contains: hypromellose, triacetin and talc. Treatment with HRT carries risks which you should consider before deciding to start it or to continue taking it. There is limited experience in treating women with premature menopause. If you have premature menopause, the risks of using HRT may be different for you. Talk to your doctor. Before starting or restarting HRT, your doctor will ask about your and your family’s medical history. You may need to have physical examination of your breasts and/or an internal examination, if necessary. Once you have started on Kliofem you should see your doctor at least once a year. At these check-ups, discuss with your doctor the benefits and risks of continuing with Kliofem. Schedule regular breast screenings, as recommended by your doctor. if you have or have ever had a blood clot in a vein such as in the legs or the lungs. if you are allergic to any of the other ingredients of Kliofem. a very high level of triglycerides in your blood. a significant rise in your blood pressure. Symptoms include headache, tiredness, dizziness. Note: Kliofem is not a contraceptive. If it has been less than a year since your last menstrual period or you are under 50 years old, you may still need additional contraception. Consult your doctor for advice. Taking an HRT with oestrogen only will increase your risk of developing excessive thickening of endometrium and endometrial endometrium. The progestagen in Kliofem® protects you from this extra risk. On average, in women who have not had a hysterectomy and do not take HRT, 0.5% will be diagnosed with endometrial cancer between the ages of 50 and 65. For women aged 50 to 65 who have not had a hysterectomy and who take oestrogen-only HRT, between 1% and 1.6% will be diagnosed with endometrial cancer, depending on the dose and the length of treatment. contact your your doctor as soon as possible. Evidence suggests that taking combined oestrogen-progestagen and possibly oestrogen-only HRT increase patients’ risk of developing breast cancer. This risk depends on how long you take HRT. However, the risk returns to normal a few years after stopping treatment. On average, of women aged 50 to 79, 9 to 17 women in 1,000 women who are not taking HRT will be diagnosed with breast cancer over a 5-year period. 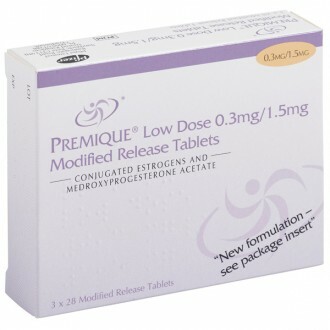 There will be 13 to 23 cases in 1,00 women aged 50 to 79 who take oestrogen-progestagen HRT for over 5 years. lumps you can see or feel. Additionally, you are advised to schedule regular mammogram screenings During the screening, inform the nurse or healthcare professional about your use of HRT, as this medication may increase the density of your breasts and affect the mammogram’s outcome. Where breast has increased density, mammography may not detect all lumps. Ovarian cancer is rare, however the use of oestrogen-only or combined oestrogen-progestagen HRT has been associated with a slight increase in the risk of ovarian cancer. The risk varies with age. For example, about 2 women in 2,000 aged 50 to 54 who are not taking HRT will be diagnosed with ovarian cancer over a 5-year period. 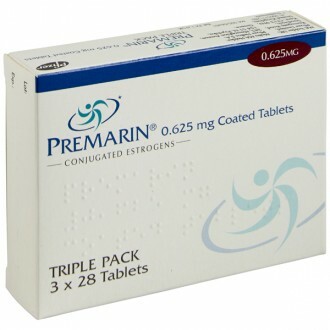 For women who have been taking HRT for 5 years, there will be about 3 cases per 2,000 users. The risk of developing blood clots in the veins is higher in HRT users than in non-users, especially during the first year of taking the medication. Blood clots can be serious, and if a clot enters the lungs, it can cause chest pain, breathlessness, fainting or even death. you are unable to walk for an extended period of time due to major surgery, injury or illness. Talk to your doctor if you have any of these conditions prior to taking Kliofem. For signs of a blood clot, see Stop taking Kliofem® and see a doctor immediately. On average, 4 to 7 women in 1,000 in their 50s who are not taking HRT, would be expected to get a blood clot in a vein over a 5-year period. For women in their 50s who have been taking oestrogen-progestagen HRT for over 5 years, there are 9 to 12 cases in 1,000 users. Women over the age of 60 who take oestrogen-progestagen HRT have a slightly higher risk of developing heart disease than those not taking HRT. There is no evidence that HRT will prevent a heart attack. The risk of getting stroke is about 1.5 times higher for HRT users than non-users. The number of extra cases of stroke linked to HRT use will increase with age. On average, 8 in 1,000 women in their 50s who are not taking HRT are likely to have a stroke over a 5-year period. For women in their 50s who are taking HRT, there will be 11 cases of stroke in 1,000 users over 5 years. HRT will not prevent memory loss. There is some evidence of memory loss in women who start using HRT after the age of 65. Consult your doctor for advice. remedies containing St John’s Wort (Hypericum perforatum). Please tell your doctor or pharmacist if you take or have recently taken any other medications, including over-the-counter, herbal medications or other natural products. Kliofem tablets can be taken with or without food and drink. If you need take a blood test, tell your doctor or the laboratory staff that you are taking Kliofem, since it can affect the results of some tests. Pregnancy: If you become pregnant speak to your doctor. Kilofem is to be used in postmenopausal women only. Breastfeeding: Do not take Kliofem if you are breast-feeding. Kliofem has no studied effect on a person’s ability to drive or operate machinery. If you have an intolerance to some sugars, you should be aware that Kliofem contains lactose monohydrate contact your doctor before taking Kliofem. Read all packaging and the Product Information Leaflet before taking any new medicine and inform your doctor of medications you take or intend to take. What is Kliofem used for? Hormone replacement therapy to relieve menopausal symptoms. A second option for preventing osteoporosis in postmenopausal women who risk of fractures and cannot take other osteoporosis medications. 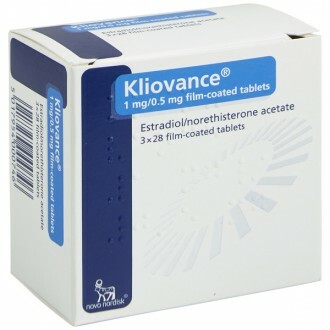 Kliofem tablets contain the active ingredients, estradiol and norethisterone acetate. 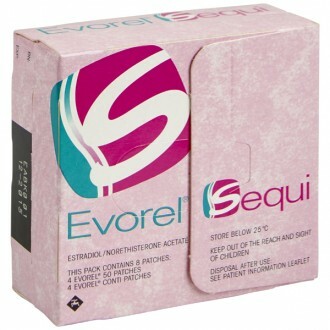 Estradiol is a naturally occurring form of oestrogen and norethisterone is a synthetic form of progesterone. Women who have not had a hysterectomy need a progestogen as part of their HRT. This is because in women with an intact uterus, oestrogen stimulates the growth of endometrium (uterine lining), which can lead to endometrial cancer if the growth goes unrestricted. Progestogen opposes oestrogen’s effect on endometrium and reduces the risk of cancer though does not eliminate it entirely. This is known as combined HRT. Kliofem is a continuous form of combined HRT. 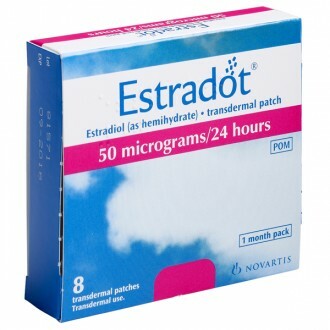 This type of HRT does not produce monthly bleeding, and is therefore more suitable for women whose natural periods have already stopped. Will Kilofem cause a monthly bleed? This medicine will not usually cause monthly menstrual-like bleeding. However, during the first few months of treatment, you may experience spotting or breakthrough bleeding. A missed dose may increase the likelihood of breakthrough bleeding. If you experience bleeding within the first few months of taking the medication or after stopping treatment, consult your doctor. How often should I review this medication with my doctor? You should discuss your use of Kliofem with your doctor once every year. What are the cancer risks? While taking HRT, you should schedule regular medical and gynaecological check-ups. Discuss continued use of Kliofem with your doctor at least once a year. All women using HRT have an increased risk of breast cancer compared with women who don’t use HRT. This risk should be weighed against the personal benefits of taking HRT. You should discuss these with your doctor. If you begin taking HRT you should schedule regular breast examinations, mammograms and conduct self-breast exams. Report any changes in your breasts to your doctor or nurse. What is the risk of stroke? Women using HRT have a slightly increased risk of stroke and of blood clots forming in the veins compared with women who don’t use HRT. The risk is higher if you have risk factors such as a personal or family history of blood clots, obesity, smoking, certain blood disorders - and needs to be weighed against the personal benefits of taking HRT. What are the chances of developing a blood clot? The risk of developing blood clots in the veins while taking HRT may increase temporarily if you experience major trauma, are immobile for long periods of time (includes travelling for over three hours without moving) or have surgery. If you will be immobile for long periods, or have planned a surgery, particularly abdominal surgery or orthopaedic surgery on the lower limbs your doctor may recommend that you stop HRT for a period of time. You can reduce the risk of blood clots during travel by getting appropriate exercise during the trip and by wearing elastic hosiery. Discuss this with your doctor. Stop taking this medication and contact your doctor right away if you experience any of the following symptoms: pain while breathing or coughing; stabbing pains or swelling in one leg; coughing up blood; breathlessness; sudden numbness; sudden chest pain; fainting; worsening of epilepsy; visual disturbances; migraine or severe headaches; severe abdominal complaints; whole body itch; increased blood pressure; yellowing of the skin or eyes; or severe depression. A woman under 50 are still considered fertile for two years after her last menstrual period for one year if over 50. HRT does not provide contraception for women who fall within this group. 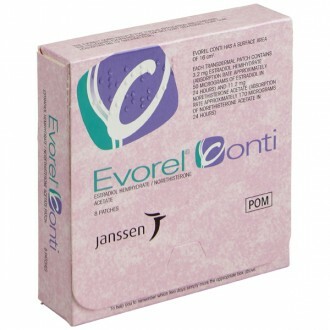 If a fertile women is taking HRT and requires contraception as well, a non-hormonal method (e.g. condoms or contraceptive foam) is recommended. This medicine should not be used if you are allergic to any of its ingredients. Inform your doctor or pharmacist if you have previously experienced such an allergy. If you believe you have experienced an allergic reaction, stop using this medication and inform your doctor or pharmacist immediately. How can Kliofem affect other medicines? Be sure to tell your doctor or pharmacist about any medications you already take or intend to, including herbal and over-the-counter medications, before you begin taking Kliofem. Women with diabetes may need to make small adjustments in their dose of insulin or antidiabetic tablets while taking HRT. Monitor your blood sugar and seek advice from your doctor or pharmacist if your blood sugar control seems to have changed after starting this medication. 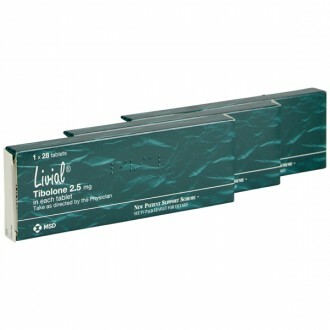 This medication may reduce the effect of medications used to treat high blood pressure. Your blood pressure should be checked periodically while you are taking HRT, but this is especially important if you are also take high blood pressure medications. This medicine may also reduce the effect of diuretic medicines. For people who take antiepileptic medication, lamotrigine, Kliofem could cause seizures to return or worsen. Kliofem medicine may not be recommended for women who take lamotrigine to treat epilepsy.